When wine aficionados contemplate the great wine regions of France, they're usually reflecting upon Burgundy, Bordeaux and Champagne, or perhaps the Rhone Valley and Loire. 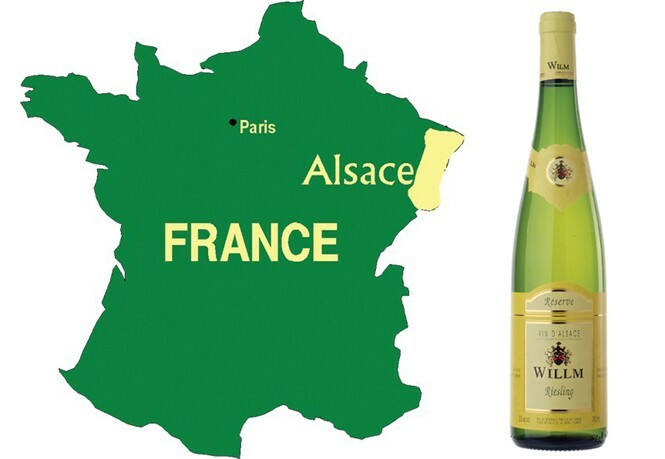 But Alsace tends to get lost in the wine shuffle. Maybe that's because Alsatian wines seem so German—unsurprising, since the Alsace region, which borders Germany, has at times been part of Germany. But Alsace, to me, is one of the most inviting and charming wine regions in the world. Houses—some centuries old—are inevitably dressed up with flower boxes, with the grandiose Vosges Mountains looming in the background. And then there's the cuisine of Alsace: choucroute garni, foie gras, flammekueche and baeckeoffe, for example, which deliciously illustrate the synergy behind a melding of German and French cooking styles. Alsatian wine, not surprisingly, pairs flawlessly with the local food flavors. Alsace is all about white wine. There's a tiny bit of Pinot Noir grown there, but the primary wine grapes are white ones: Riesling, Pinot Gris, Gewürztraminer, Pinot Blanc and Muscat. Riesling and Gewürztraminer, in particular, get a bad rap for being sweet. Not so in Alsace. The wines here can be bone dry, bold, distinctive and delicious. And, Alsatian winemakers tend to hold onto the belief that wine should be an expression of the terroir it comes from as well as of the grape from which it's made. Purity is key, so you infrequently find blended wines from Alsace. Thus, Pinot Gris is almost always 100 percent Pinot Gris, Riesling is 100 percent Riesling, and so on. Since Alsatian wines are usually produced with the aforementioned philosophy of purity in mind, they tend to be "hands-off" wines that aren't manipulated much by the winemaker. Oak is rarely used for fermentation; Alsatians prefer neutral containers like cement-and-stainless-steel tanks. And the wines don't go through the process of malolactic fermentation (which "softens" the wine), allowing for dry, crisp, acidic wines that fully showcase the region's Riesling, Pinot Gris, Pinot Blanc and other grapes. The main producers of wines in Alsace are Hugel et Fils, Domaine Zind Humbrecht, Kuentz-Bas, Trimbach, Domaine Marcel Deiss, Domaine Weinbach, Helfrich, Willm and Domaines Schlumberger. Wines from all of these houses are available in Utah. Here are a handful of my favorite, less expensive ones. For a prototypical expression of Pinot Blanc, I turn to Domaines Schlumberger Pinot Blanc Les Princes Abbés ($15.99), a lively wine that's the perfect accompaniment to flammekueche (onion tart). The first Alsatian wine I ever tasted was Trimbach Pinot Blanc ($15.99), and it's still a favorite to serve as an aperitif or to sip with shellfish. Willm Riesling Réserve ($14.99) brims with green apple, white-peach and mandarin-orange flavors, balanced with snappy acidity. This Riesling would partner well with a range of flavors, from sauerkraut to sushi. Kuentz-Bas, which sits on one of Alsace's highest points and which has been producing wine for 220 years, makes an interesting blended wine called Kuentz-Bas Alsace Blanc ($15.99), composed of Sylvaner, Auxerrois and Muscat. It's bone dry with lively, bright citrus flavors—a unique opportunity to try an Alsatian blended wine. I love Domaines Schlumberger Pinot Gris Les Princes Abbés ($20.99), a well-balanced Pinot Gris with apricot, white peach and honey notes, combined with a hint of smoke. It's an ideal pairing for choucroute garni. One of my favorite bottles of Gewürztraminer, although leaning toward the pricy end of the spectrum, is Domaine Zind-Humbrecht Gewürztraminer ($28.95), which is about as good as Gewürztraminer gets. Beautiful floral rose aromas accompany elegant spice tones and flavors of lychee, apricot and ginger. It's a match made in heaven for foie gras.